Say hello to Florence Dickson. RPPCs of people sometime go for big bucks on eBay, particularly if they are ethnic (African-American, Native American) or engaged in some sort of activity (work-related, recreational or leisure). Cards of “gay interest” are often advertised that way, though labeling the 19th century tendency for men to be physical with one another may be a projection of our own behavioral prejudices and not representative of what the people then might have thought about a hand on a shoulder. More often than not, the subjects of these cards are unidentified. So those that are merely portraits are priced to sell. I, of course, see them as potential citizens of Fennimore county or others simply passing through and leaving their mark in one way or another. 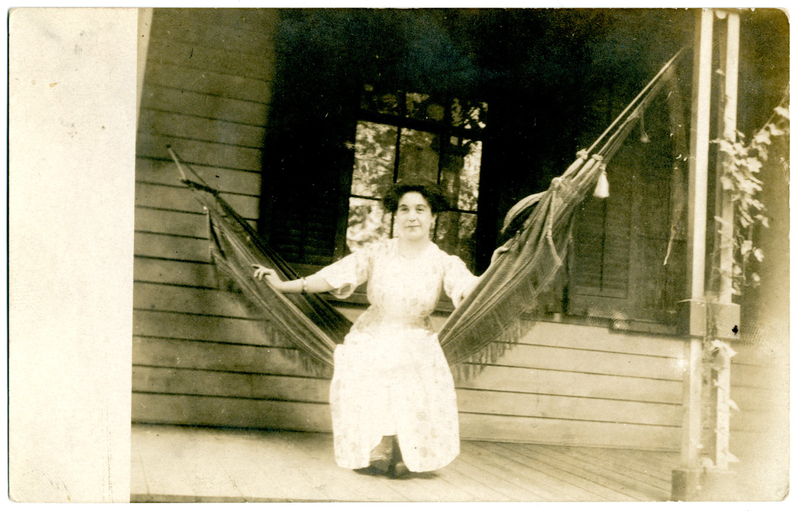 In this case, happily, this young woman is identified as Florence Dickson, the date was 1910, and her home was at 514 North 4th Street. On the card’s reverse, her name was penciled in as “Dixon” and then corrected in ink by another hand to “Dickson,” so she must have been known. I like several things about the card: she is posed, yet casual; the address actually works for the Agincourt townsite by the simple addition of an “N.W.” to put here in the quadrant of the city that most closely would have resembled her front porch. I also find 1910 coiffure especially attractive: big like Texans of the late 20th century, but in Florence’s case, horizontal rather than vertical. It’s wonderful, the way the reflective window glass frames her face; the kind, gentle smile of someone willing to laugh with you, not at you. And who was the photographer? A prospective beau, perhaps. That address, now modified — 514 Fourth Street N.W. — would have placed her in 1910 across the street from the former orphanage only recently converted to the new Normal School teacher-training college. She might indeed be one of its early faculty, come to train other younger women for careers in public primary education. But it’s summer, classes are over, and Florence has time to relax on the front porch. Perhaps it’s the front porch of a boarding house where she lives and takes meals with other faculty and students from Northwest Iowa Normal. But whose house? Widows like my grandmother took in boarders before the advent of Social Security [and may once again if Congress has its way]. You can see how this simple real photo postcard opens a minor world of possibilities yet to be explored. By agincourtiowa in Uncategorized on Saturday/10/September/2016 .